Roger learned the art of leadership from his ships’ commanding officer and executive officer, who together led the tired, old ship, which was a bit of a laughing-stock along the waterfront, to win the Arleigh Burke award as the best destroyer in all of the Pacific Fleet. Roger served another fifteen years after that, having had during that time the privilege of being the fire control officer for the U.S.S. Missouri’s 16-inch guns, and thus the only naval officer in the world (at that time) under the age of thirty proficient in the ancient–and wonderfully obsolescent–art of major caliber naval gunnery. 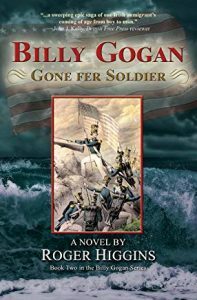 In Billy Gogan Gone fer Soldier, Billy Gogan enlists in the U.S. Army, only to be forced to battle a new enemy on the eve of the Mexican-American War. The fearsome and sadistic Sergeant Hoggs’s reign of terror is cut short, however, by a young second lieutenant named Ulysses S. Grant. 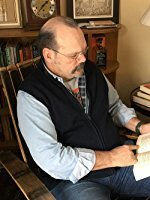 Billy and his companions are part of the biggest army assembled by the United States in decades, which has been ordered to the banks of the Nueces River to defend Texas. But the army is both tiny, hardly 3,000 combatants, and woefully unprepared for war. The army’s beloved commander Zachary Taylor, known to his bluebellies as Old Zach, slowly whips the army into shape over the winter of 1845-46, as disease ravages officer and soldier alike. In the spring, the army is ordered south to the northern bank of the Rio Bravo. All is not well. The army’s savage discipline causes scores of desperate doughboys to desert and swim across the Rio Bravo to an imagined paradise. War begins badly for the Americans. But Old Zach eventually wins a pair of victories that send the Mexican army scuttling south to Monterrey. Billy is then sent on a mission with the Texas Rangers, which ends in a tragic war crime. Billy Gogan Gone fer Soldier ends on a lonely rooftop as the bloody fighting on the savage first day of the Battle of Monterrey concludes in American defeat.